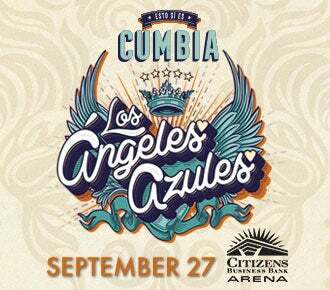 Los Ángeles Azules known worldwide as the creators of the symphonic cumbia, return to the U.S. with their “Esto Si Es Cumbia” tour making a stop at Citizens Business Bank Arena on Friday, September 27. With sell out performances in Los Angeles, San Jose and across the country, Los Ángeles Azules fans will enjoy all their hits including "El Liston de tu pelo," "Como Te Voy a Olvidar," “Mi niña Mujer," “Entrega de Amor,” “Mis Sentimientos,” “17 Años,” and more. This will be an unforgettable show. Their most recent album "Esto Si Es Cumbia", recorded in Yucatan MX, went on sale last summer and has featured artists such as Ha*Ash, Gloria Trevi, Migue l Bosé, Fito Páez, etc. Their current single "Nunca Es Suficiente" with Natalia afourcade is on Apple Music’s "Best of 2018" list and is #6 on radio charts. Tickets are available at the venue box office, online at Ticketmaster.com, All dates, acts and ticket prices subject to change without notice. Citizens Business Bank Arena, built and owned by the City of Ontario, operated by SMG, can accommodate over 11,000 guests. The 225,000 square foot venue features 36 luxury suites located on two levels and a continuous concourse hosting a variety of concession and refreshment stands, merchandise kiosks, the San Manuel VIP Club and other fan amenities. Citizens Business Bank Arena hosts over 125 events annually including concerts, family shows, and sporting competitions. The Arena is home to several sport teams including: Ontario Reign (American Hockey League), Ontario Fury (Major Arena Soccer League), Aqua Caliente Clippers of Ontario (G League Basketball), and LA Temptation (Legends Football League). Founded in 1977, SMG provides management services to 243 public assembly facilities including convention and exhibition centers, arenas, stadiums, theaters, performing arts centers, equestrian facilities, science centers and a variety of other venues. With facilities across the globe, SMG manages more than 19 million square feet of exhibition space and more than 1.5 million sports and entertainment seats. As the recognized global industry leader, SMG provides venue management, sales, marketing, event booking and programming, construction and design consulting, and pre-opening services for such landmark facilities as McCormick Place & Soldier Field in Chicago, Moscone Convention Center in San Francisco, Houston’s NRG Park and the Mercedes-Benz Superdome in New Orleans. SMG also offers food and beverage operations through its concessions and catering companies, currently serving more than 140 accounts worldwide. For more information visit www.smgworld.com.